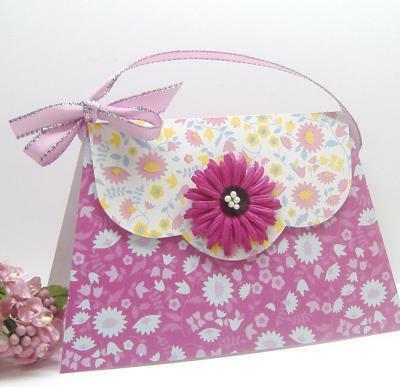 With left-over papers, flower, and ribbon you can create a pretty purse card. It makes perfect gift for birthdays. Approx. Time to complete: Less than 15 minutes. Fold floral pink patterned paper. Place the purse template to the center of the folded card. Use the pencil to draw around the shape. Cut out. Trace the flap into light floral patterned paper. Cut it out. Then cover the card using foam adhesive for dimensional effect. Tie a bow using purple ribbon around the folded card. Note: The patterned papers used are thick enough to stand up. 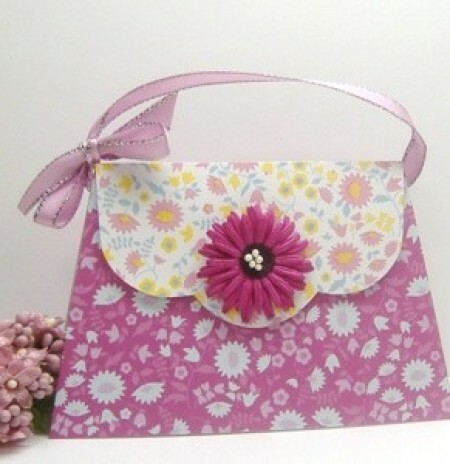 Click Here for the Purse Card Template. I guess I'm better at giving instructions instead of reading them LOL!! Thanks for all your information! It is an adorable idea? It is thick and so I didn't use a cardstock. The opening is on the purse, not on the flap. To make the flap, trace the template onto the patterned paper, cut it out. Adhere on top of card using foam adhesive for dimensional effect. Wrap around purple ribbon on the folded card to make a handle. Finish it off with daisy flower. Thank you.